Well, it seems mama Christmas has brought gifts early this year. After her outburst last week prompted so many people's complaints, we're now starting to see some action. The Times of Oman wrote that from July there will be 500 new parking spaces made available. Its great that some genuine local issues are being covered by local papers (what on earth has happened to Muscat Daily)? So, from July there will be 500 additional parking spaces available, however I'm not sure how people will have direct access to the mall - there's no entrances on that access road between the MGM and the 3rd phase. Perhaps they'll build a bridge or something. I don't know. Behind the scenes, the management have also been busy as a result of the social media uproar last week. On the 14th last week (the day after I blogged about it, and 2 days after the MWCIF thread started) the letter above was sent to all retailers and staff who work in the MGM. 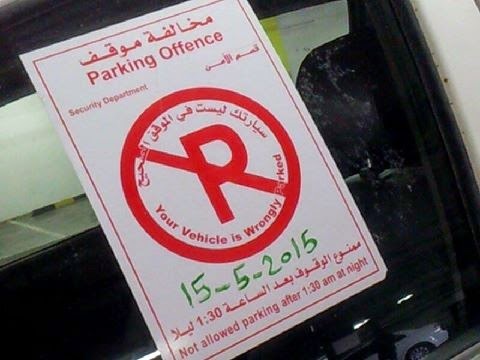 They've been told to park next to Carrefour and leave the main parking area free for actual customers. Unless the rest of the parking is barricaded off, I don't see how this will work. People are always going to take the easiest option, they're not going to park up there unless they have no other choice. So, time will tell. 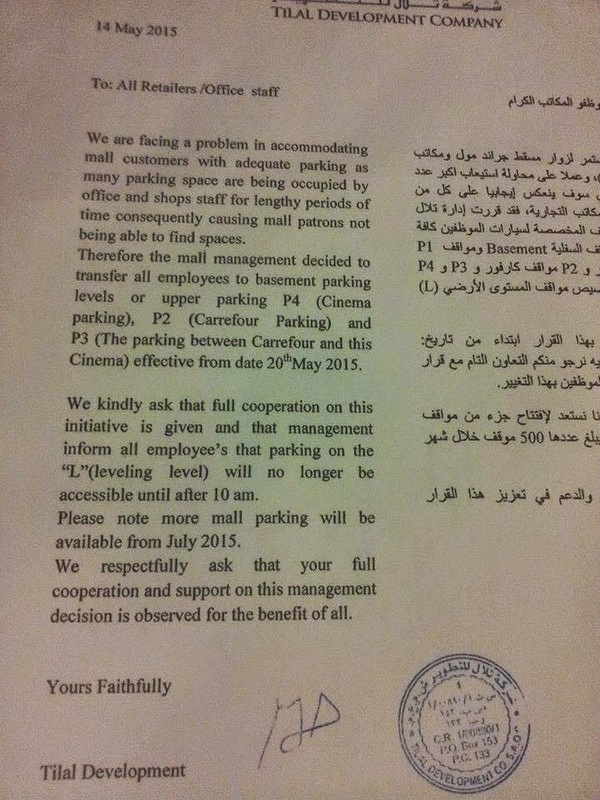 But I'd guess that the carrefour stacked parking will fill up before all the staff have parked, we'll see! The other piece of behind the scenes action that's happened is the top picture on this post... they're starting to sticker peoples cars again. Hopefully this will help free up more spaces. 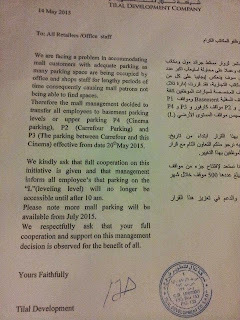 I guess it's a happy problem for a mall to have, its so busy it needs more parking, nonetheless, a problem still. Lets hope they get their additional parking ready on time in July.